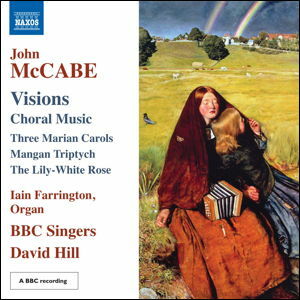 A recording of choral music by John McCabe was released by Naxos in December 2012. Mainly, though not entirely, a cappella, it is splendidly performed by the BBC Singers under David Hill, with organist Iain Farrington accompanying four items. Works include McCabe’s major (28-minute) Mangan Triptych, three Marian Carols, The Lily-white Rose, and various other sacred and secular works, such as The Last and Greatest Herald, written for St John’s College, Cambridge, in 2008, and selected for inclusion in The Choirbook for the Queen published to celebrate the Diamond Jubilee of HM Queen Elizabeth II. The recording, produced by Michael Emery and recorded at St. Paul’s Church, Knightsbridge, London, is released by arrangement with BBC Music. The Naxos catalogue number is: 8.573053. "John McCabe writes that he composes carols ‘as relaxation from sterner stuff’. It is classy relaxation: the setting of I Sing of a Maiden …is raptly atmospheric and consummately crafted, while the writing for solo soprano in Dormi, Jesu! is alluring ... [Mangan Triptych] ... The rapier-like phrases sliced out in And then no more, and the sharply unanimous dispatch of attacca accents in Motet are but two examples of the singers’ deep appreciation of the music’s requirements, and David Hill’s alert, accomplished conducting." "... this superb disc ..."